Born in 1986, he began his studies at the S. Cecilia Conservatoire of Rome; in 2000 he won a scholarship to study at the Purcell School of Music in London with Ian Jewel, he then furthered his studies also in conducting in the Royal College of Music. 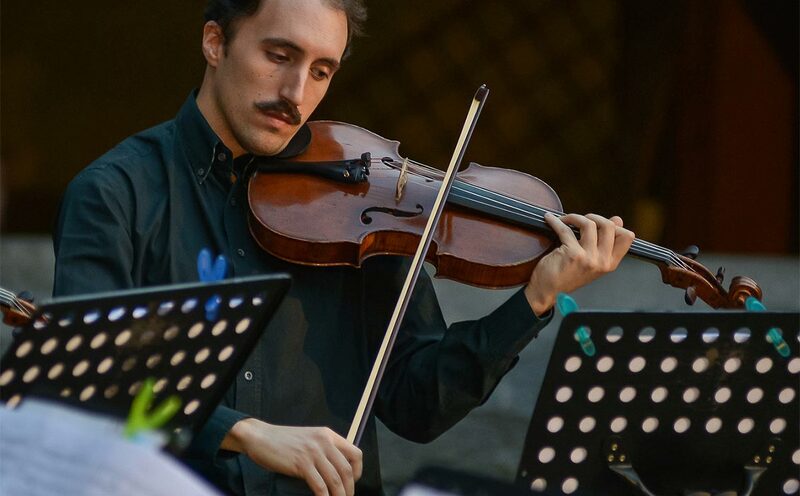 Daniel has studied in Cremona and Siena under the guidance of Bruno Giuranna with whom he has performed extensively throughout Italy with other renowned musicians such as Accardo and Meneses. With the same formation, in 2007 he performed quintets in a tour of South America, playing in halls of Buenos Aires, Montevideo and Mendoza. He also collaborated in chamber music concerts with Helmerson, Neubauer, Schmitt, Schellenberger, Vengerov. Since 2000 he has performed throughout Great Britain (highlights include Walton Concerto in St. John’s Smith Square, recital at the Royal Festival hall and recital at the Wigmore hall) and America (Boston and New York). As a soloist he toured Italy, Malta and Estonia with the World Youth Orchestra in 2005 and in 2008 he returned to perform Paganini’s Sonata for Viola and Orchestra in the Piacenza theatre. He has performed in Duo performances in festivals in Switzerland (Bellinzona) and in many Italian cities (Brescia, Lecco, Milan, Siena, Rome, Pescara, Bari, Palermo). In 2008 he was the youngest winner for principal viola post in the San Carlo theatre of Naples. In 2009 he collaborated with the Orchestra of Udine and Bruno Giuranna in performances of Britten Lachrymae, in Trieste and Udine. He retains prizes and scholarships from the Solti Foundation, Hattori foundation, Martin musical scholarship and Rotary club. Chosen for a program for rising solo artists Cidim, Daniel gave Concerto performance with Roma Sinfonietta and has toured throughout Italy. He won Second prize in the Brahms Viola Competition in Portschach, Austria, and the First prize and Audience prize in the Watson Forbes Viola Competition and the Valentino Bucchi of Rome. In 2012 he took the top Viola prize in the Budapest International Competition. In the next season he will perform with the National Youth orchestras in Scotland with performances in Edinburgh and Glasgow and will give a recital in the Purcell Room in the London Southbank. Since 2012 he is professor of Viola at the Rome Conservatoire. He plays on a viola made in 1800 kindly loaned by the Accademia Chigiana.